Adeline Andre was born 1949 in Bangui, Central African Republic. She studied in Paris at the Ecole de Haute couture. As a young student Adeline was taught by Surrealist painter Salvador Dali, who had a great influence on her work. In 1970, after receiving her diploma from the School of the Syndicate Chamber of Parisian Couture, Fashion Designer Adeline Andre entered the House of Christian Dior as assistant to Mr. Marc Bohan for the Haute Couture collections. 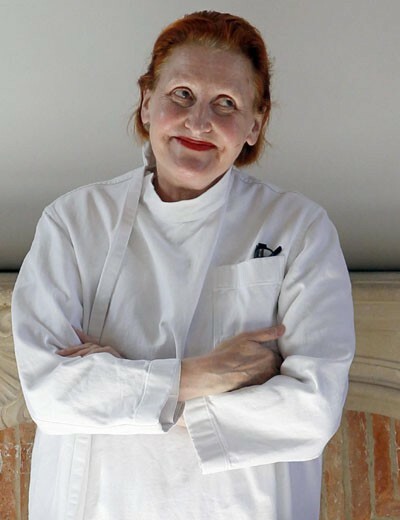 She worked at Louis Feraud in 1973, then for Castelbajac, before launching her own salon in 1981 with the help of Hungarian architect Stevan Dohar. They also had finances from Nicolas Puech-Hermes. In 1981, Adeline Andre registered the pattern of her "three sleeve-hole" garment at the National Institute of Industrial Property in Paris and in 1982 at the World Intellectual Property Organization in Geneva. A "three sleeve-hole" garment is also part of the museum collection of the F.I.T. Fashion Institute of Technology in New-York. Adeline Andre's first show, ladies ready-to-wear collection for fall-winter 83/84, was held on March 16th, 1983 at the Daniel Templon gallery. Staged within a grand painting by Gerard Garouste, the guests, wearing the collection, posed for giant polaroid shots. Up until March 1987, Adeline Andre presented her collections in places that had never before been used for fashion-shows, like the "Grant Salon" of the International Conference Center where the Treaty of Paris was signed, putting an end to the Vietnam War for example. Adeline briefly worked for the house of Jeanne Lanvin as a knitwear designer from December 1989 to February 1990. In these places, she presented her collections on models such as Anh Duong, Angela Wild, Dovanna, Terry Toye and Eugenie Vincent, whom she asked to mingle among the guests, creating a calm and intimate atmosphere as opposed to the podium shows of the time. During the furor of padding and stretch in the fashion world, Adeline Andre presented tall and slender shapes with slight and svelte shoulders in fluid materials such as, silk crepes, wool satins, fine cashmere cloths--always dyed according to her personal colour range and also knits with rolled hems. During the following years, she concentrated on creating designs for her private clientele, male and female, for whom she produced new made-to-measure collections, displayed for the first time at "Top of wear" parties, travelling private presentations in galleries, workshops or the salons of her friends in either Paris, London or New-York. In 1994, Adeline Andre moved into her atelier-boutique at 5 Rue Villehardouin, in the Marais, the old Paris quarter near Place des Vosges. As well as her ready-to-wear collections, each season, since 1995, she has presented a Couture collection. Her Fall 2002 collection was the first Haute Couture collection she has presented. The Haute Couture association had invited her to become a member. It was very well received.